I admit that I can be sucker for shiny things sometimes. It’s fair to say that I’m not a huge fan of match-3 games, but when I get caught up in them, it’s as much for the glitter and sparkle as things explode as anything else, so for me, graphics really matter when it comes to casual puzzle games like Jewel Craft. Thankfully, the visuals don’t disappoint, and while the game overall isn’t a bad way to pass the time, the general gameplay and mechanics are well-traveled and fairly stale standards. 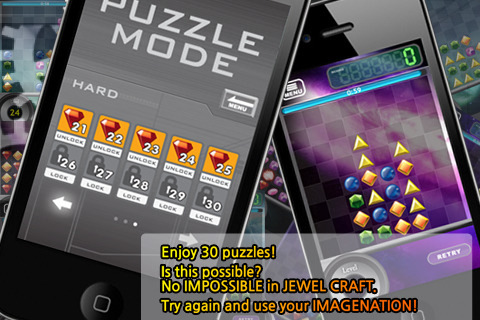 An attractive puzzle game, Jewel Craft definitely ranks among the better match-3 games out there, although it brings very little by way of innovation to the genre. In many ways, this is a straight-up Bejeweled clone with just enough minor tweaks to make it a different game, but it’s a very well done clone, with excellent graphics, reasonably smooth gameplay, and some mild innovations that keep the constant action interesting. There are four different playing modes: Classic, Crazy, Puzzle, and Battle Mode. Classic is about what you’d expect, Crazy allows you to switch gems regardless of whether or not they make a match, Puzzle has you move gems strategically to clear the entire board, and Battle Mode is probably the best reason to give Jewel Quest a try if you’re a die-hard match-3 fan. Battle Mode allows you to compete head to head with a friend or random stranger via Game Center for the high score, which can in some pretty swift and furious action. Classic, Crazy, and Puzzle modes are also comprised of timed levels, so there’s always a sense of general urgency. There are also additional bonuses available for combo strings, and special gems are created when you match 4 or 5 gems. Unfortunately, the special gems are just standard bomb gems, nothing unusual or innovative like the heroes in Babo Crash, for example, but it does mean the game never trips you up with new things to learn. All in all, I was satisfied with Jewel Craft as a decent, if not terribly interesting match-3 game, but I have to say that while the game overall was very polished and professional, I really hated the sound. It just didn’t have the same sparkle as the graphics and made the experience fall a little flat, but otherwise, it’s a perfectly decent match-3, perhaps a little too safe and boring, but the high production values certainly make this a reasonable alternative to Bejeweled 2. 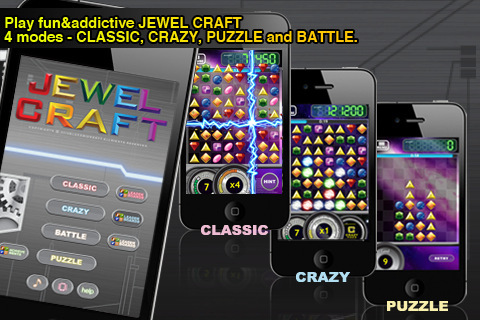 AppSafari review of Jewel Craft was written by Tracy Yonemoto on November 30th, 2010 and categorized under App Store, Games, iPad apps, Multiplayer, Puzzler. Page viewed 3922 times, 1 so far today. Need help on using these apps? Please read the Help Page.